Did we mention this would be a busy Halloween season? Because it’s already a busy Halloween season, as evidenced by the fact that today’s Halloween Horror Nights update is going up on a Saturday. 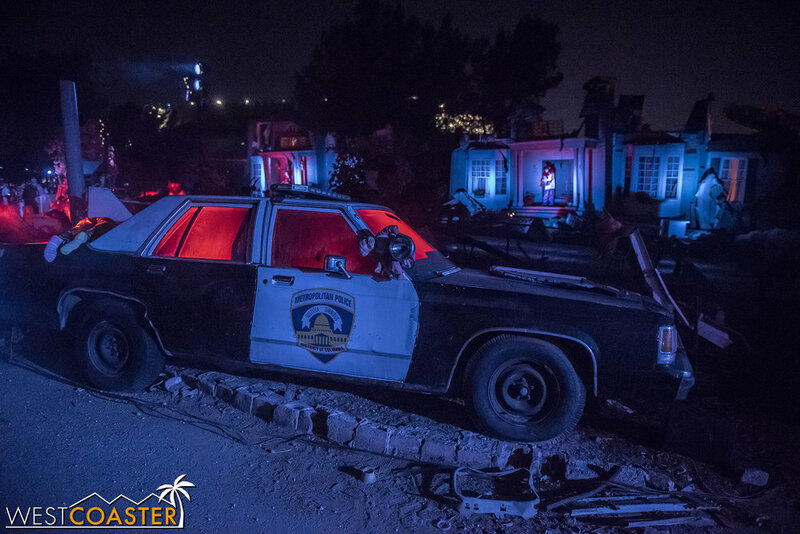 Yes, we’re coming back to Horror Nights after a Fright Fest interlude, and today, we’re going to once again mix things up and look at scare zones and the Terror Tram in detail before we move onto the mazes. 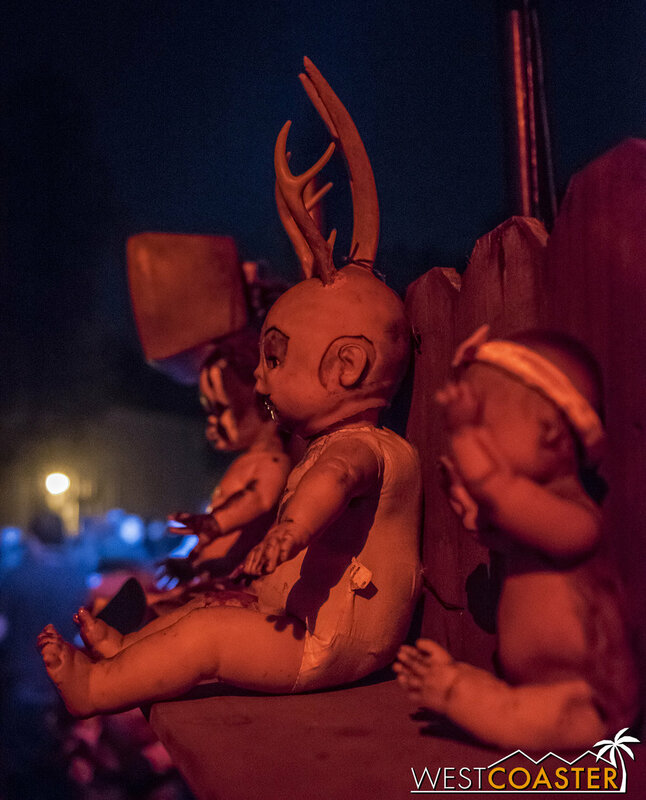 This year, Halloween Horror Nights provided five different scare zones, up from last year’s measily three (though two of those scare zones occupy a space this year that traditionally has been grouped together as one scare zone). 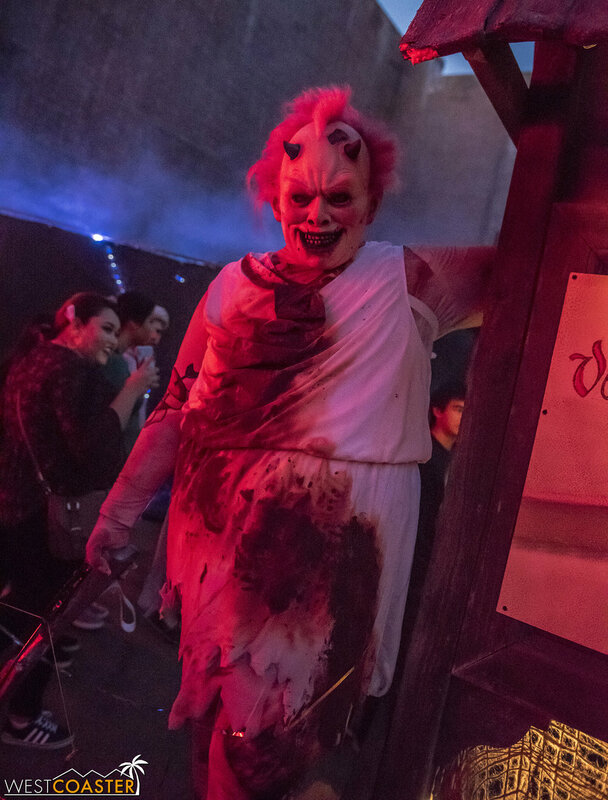 In addition, the Terror Tram, while conceptually the same as normal, provided a little more creative iteration, bringing back popular original-concept killer clown, Hollywood Harry, and setting up several themes that functioned as mini-walk through’s for guests disembarking. Lets get to it, shall we? In this update, photos are by myself and Dan Angona. Two years ago, Universal Studios introduced the legend of Hollywood Harry, a former television clown who fell out of popularity once clowns lost their pop culture appeal and started becoming more associated with creepy fellows not to be associated with. Committed to his craft, he maintained his clown personality, working odd jobs here and there, including being an unofficial mascot at Universal as a street performer just outside the park gates. However, his spiraling tendencies eventually caught up to him, and after being banned from property, the one-time Harold Kappowitz embraced his inner darkness and re-emerged as Hollywood Harry, a murderous clown with a legion of bloodthirsty psychos around him. 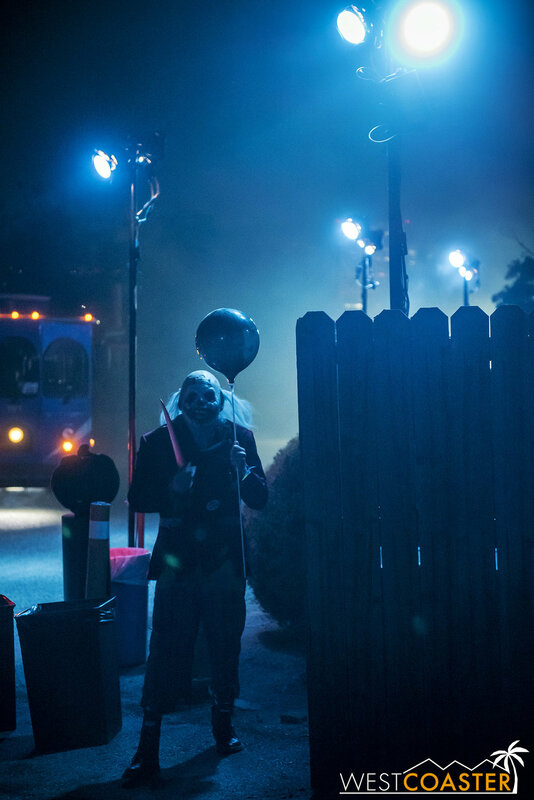 He took over the back lot in Halloween Horror Nights 2016, spreading chaos, until disappearing mysteriously. Clown. It had to be a creepy clown. Well, now he’s back, and he’s assembled a collection of horrid bedtime stories for guests. There’s an opening with ravenous dog-people by Who-ville, and another tale about a demented family of hillbillies at the Bates Motel. 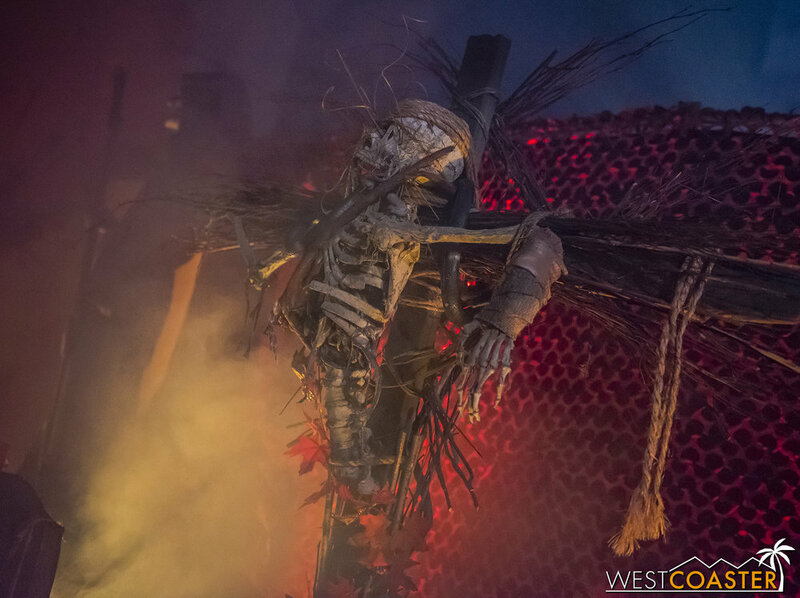 Scarecrows stalk by the Psycho House and plant people in the ground. 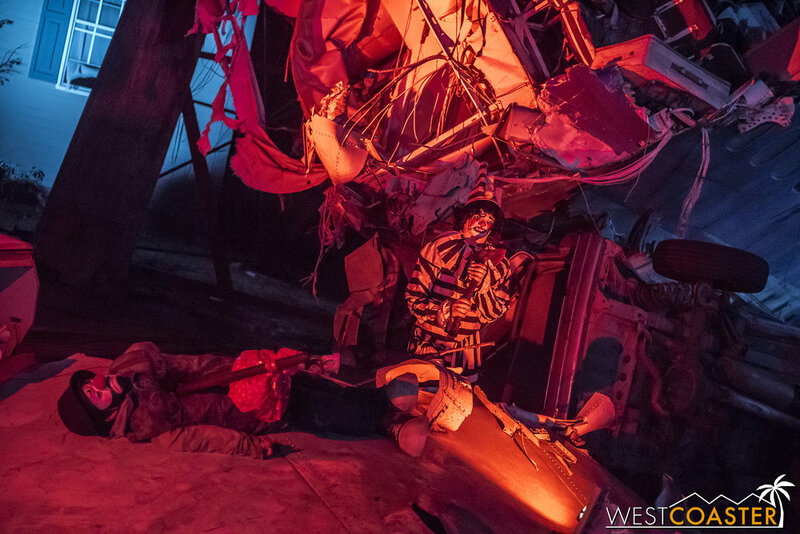 Clowns feature prominently in the War of the Worlds crash site, while the theme of gruesome, gory nightmares concludes the tour. I kind of love the concept of scarecrows planting humans vs the other way around. They could have run even more with it by having the planted humans be harvested as zombies. 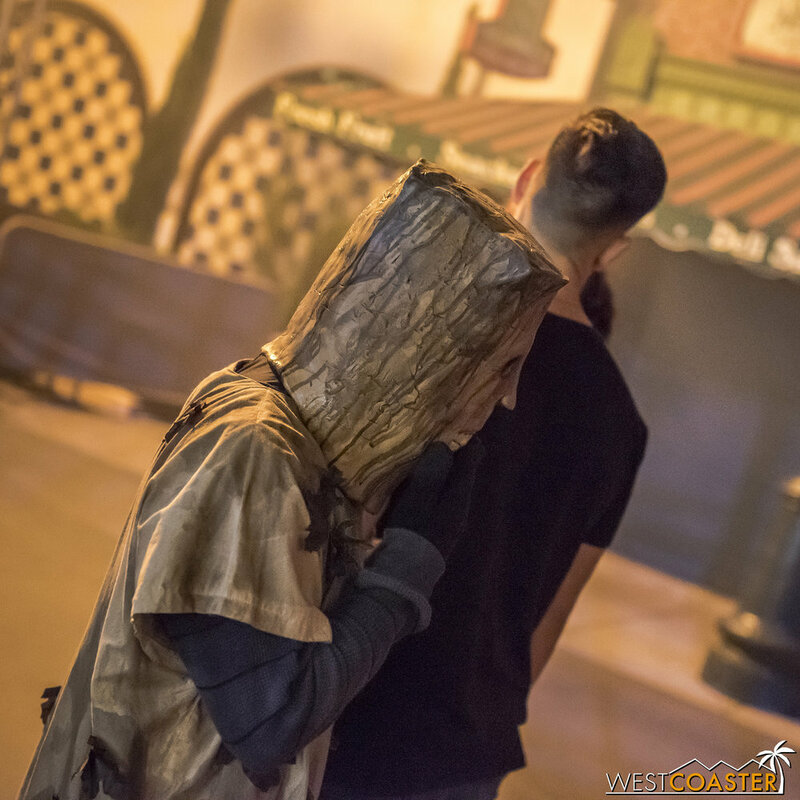 Guests can also detour for a photo op in front of the Psycho House after the Bates Motel. It’s a wait, but then again, the Terror Tram procession also backs up at a bottleneck in front of the Scarecrow section and then again at the end of the War of the Worlds set. Traffic flow can definitely use some improvement. LOG BUNNY!! He moves around every night. Never let a clown do your hair. 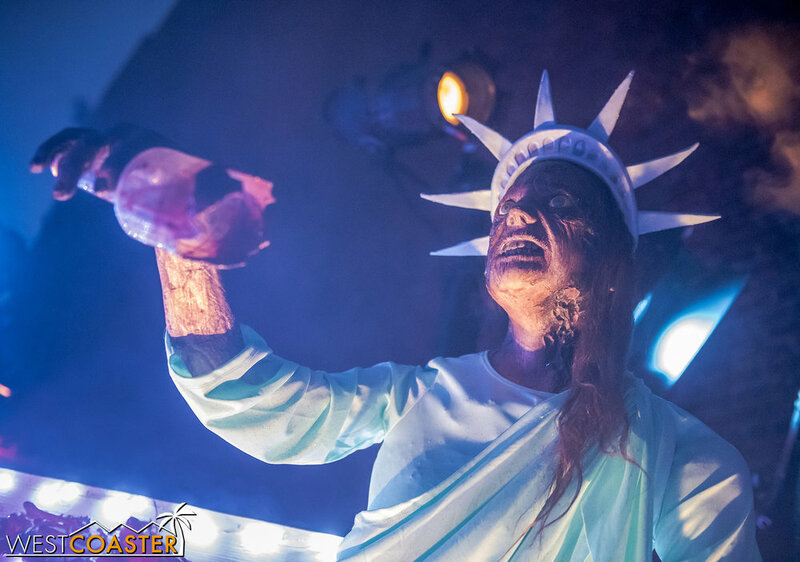 Although the sequencing of the Terror Tram remains the same as always, the freshening up of the themes and the return of an original concept was certainly welcome. The scares themselves seemed a little sparse during our opening night trek through, but the scenery provided some nice variety. At this point, the Terror Tram is what it is, and like the scare tactics of the mazes, shows no signs of changing anytime soon. 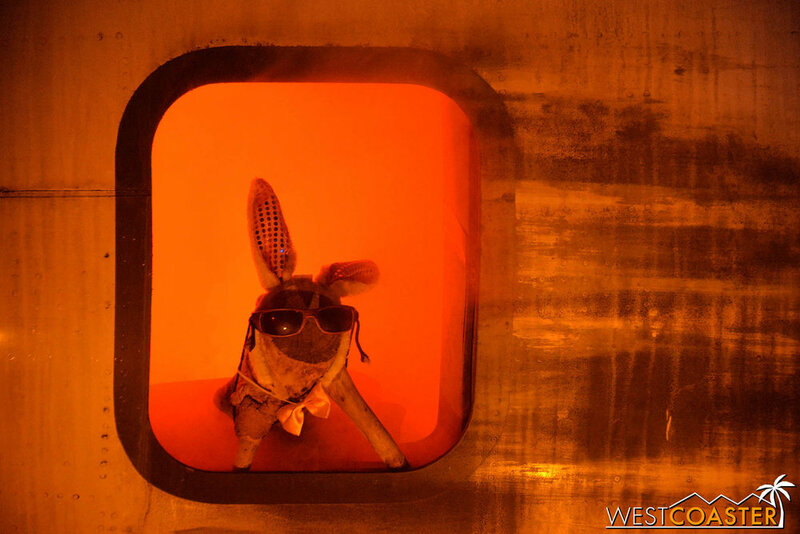 But I did like the vibe of this year’s Terror Tram more than most recents, and mainly wish the cast had been more targeted when we went through. 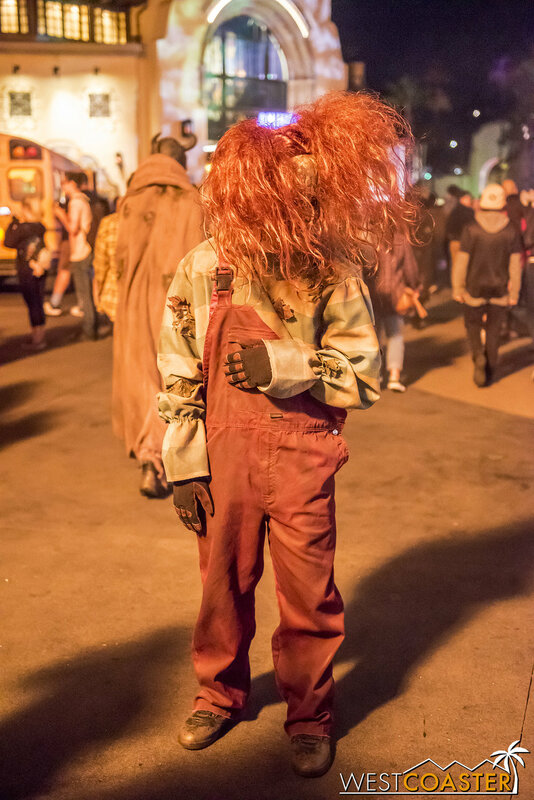 This year, the entry scare zone was split into two segments. 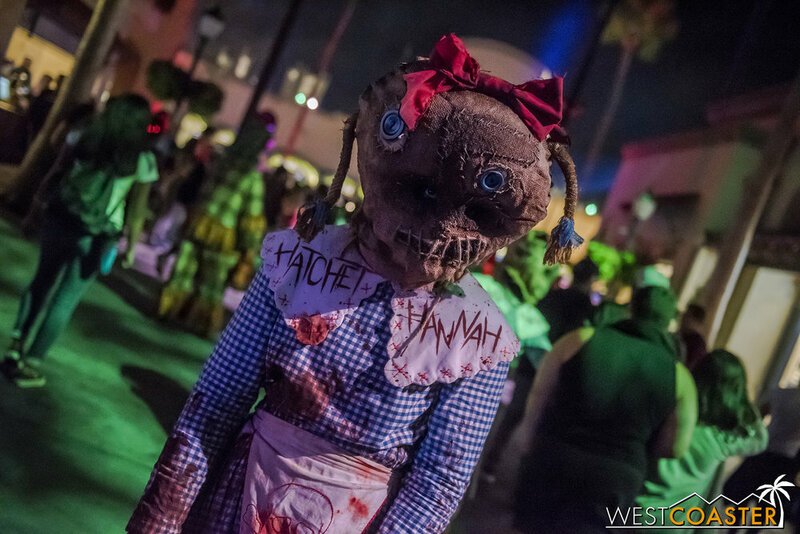 Hell’s Harvest comprises the avenue portion, from the front gates all the way up to the intersection of streets adjacent to Universal Plaza. Dan was very upset at the lack of dancing ladies this year. This very well could have been in response to the #MeToo movement and avoiding objectification of women, though, as Dan also pointed out, the answer to that could have been to provide both male and female dancers. Or it could have just been a budgeting or staffing decision. 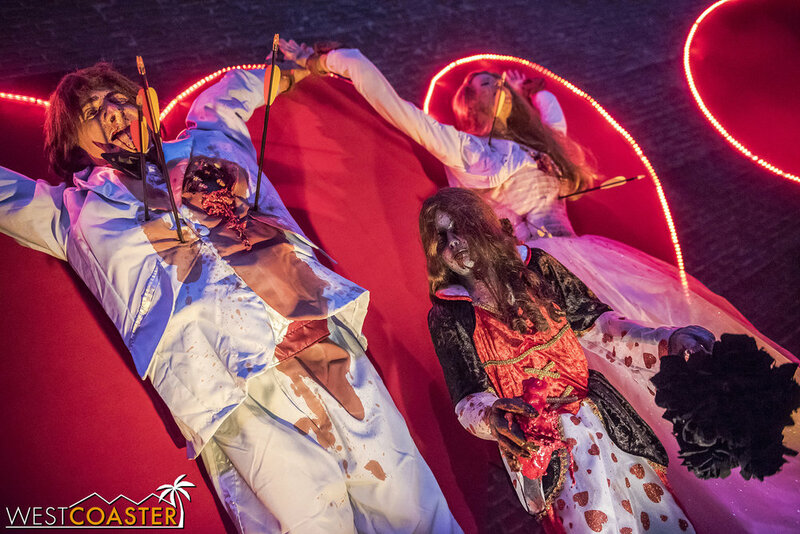 In any case, no go-go dancers at HHN for the first time in my memory. 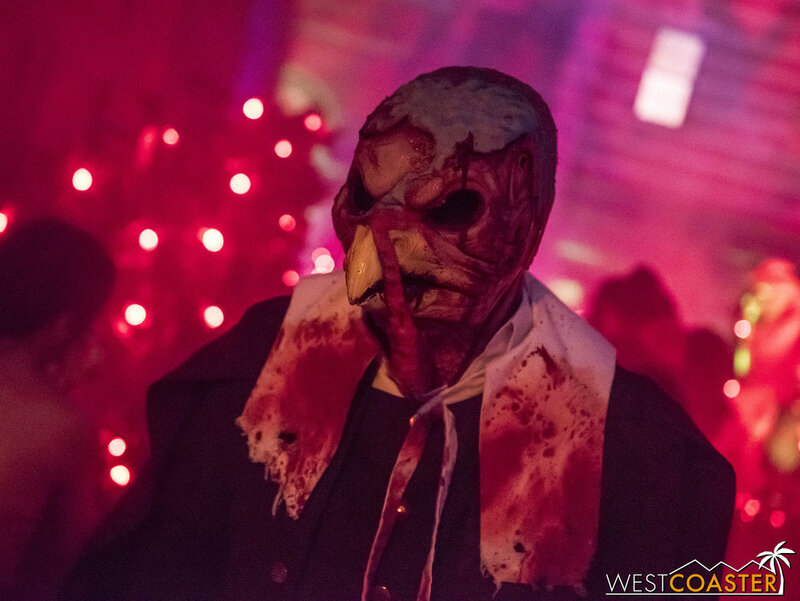 Featuring a sort of reaper theme, Hell’s Harvest was where the majority of the upper lot chainsaw monsters clustered. 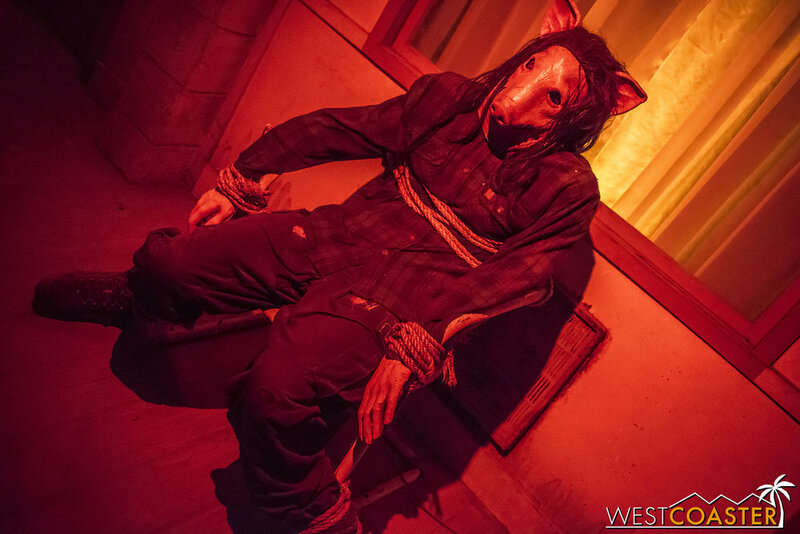 With odd, voodooesque-masked scareactors with creatively alliterative names, it was short and sweet. There was pretty good energy throughout the evening, but being half of its usual length did make the area seem a little short. The alliteration contrasts cuteness against the gore. 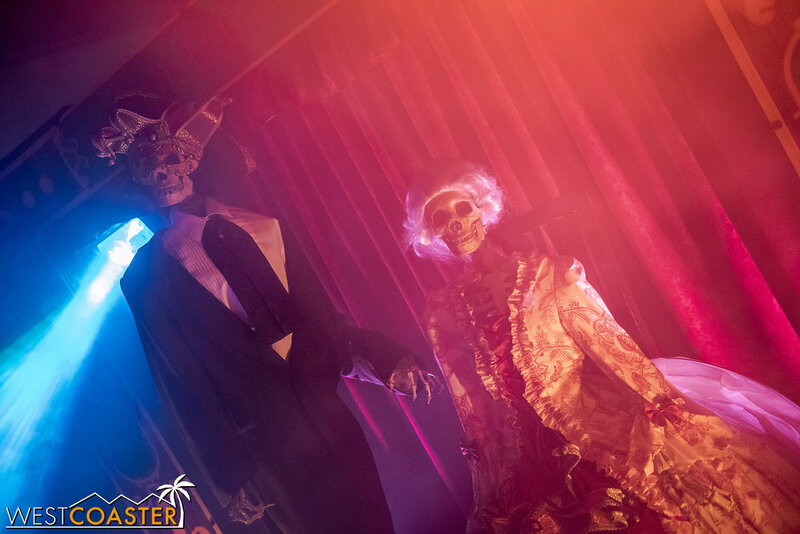 Also of note was a fun little heckle cart with animatronic skeletons spitting murderously corny humor. It was silly and groan-worthy, and some might even say annoying, but I personally like it and thought these two bony chaps brought some variety to the environment. These two banter back and forth, tell guests their “fortune,” and generally provide some dreadful puns. 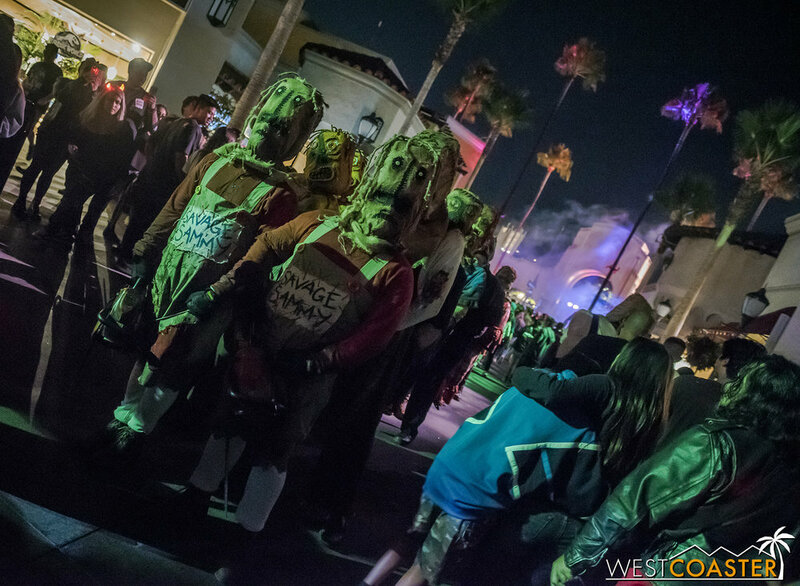 The largest Upper Lot scare zone occupied the area next to Universal Plaza. Back were the traditional fire towers, punctuating the night with blasts of inferno. 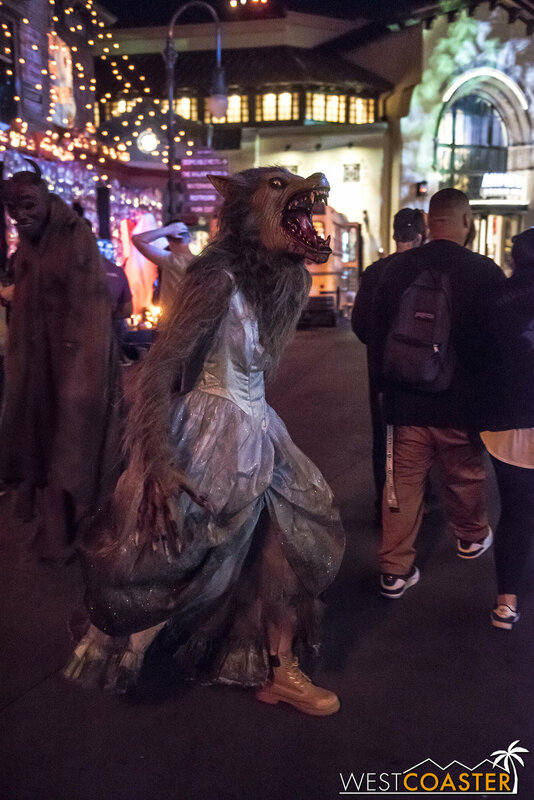 Themed to the movie, Trick ‘r' Treat, this scare zone featured scareactors dressed in an assortment of classic Halloween costumes, from vampires to werewolves to pumpkin heads to demons and stuffed animals. Aside from a few photo very pretty photo op backdrops, this was the main extent that tied to the movie. 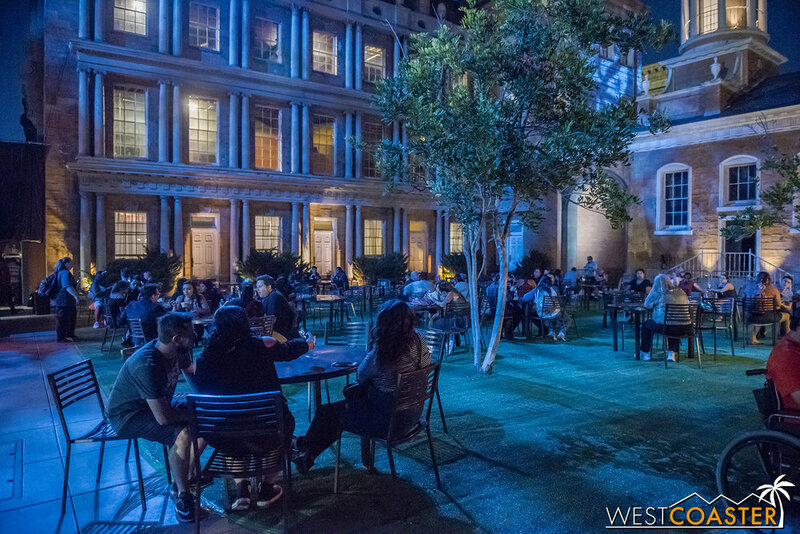 Within the New York theme of the facades surrounding it, there did not seem to be a ton of significant investment to create an immersive world, but that’s okay. 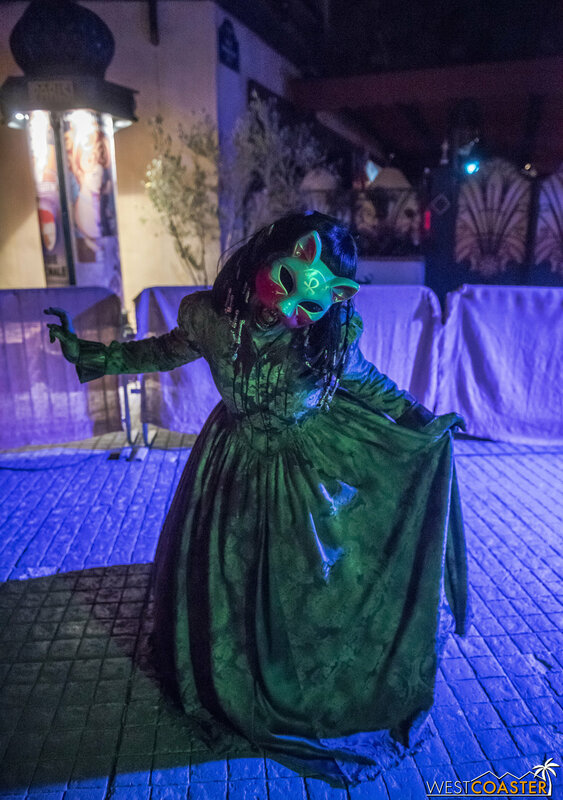 The area is highly trafficked, and the main draw (in my opinion) were the scareactors anyway, who had plenty of chances of interaction and frights. Jack Skellington looks a little different. A tongue vampire. Which I guess is sort of expected. 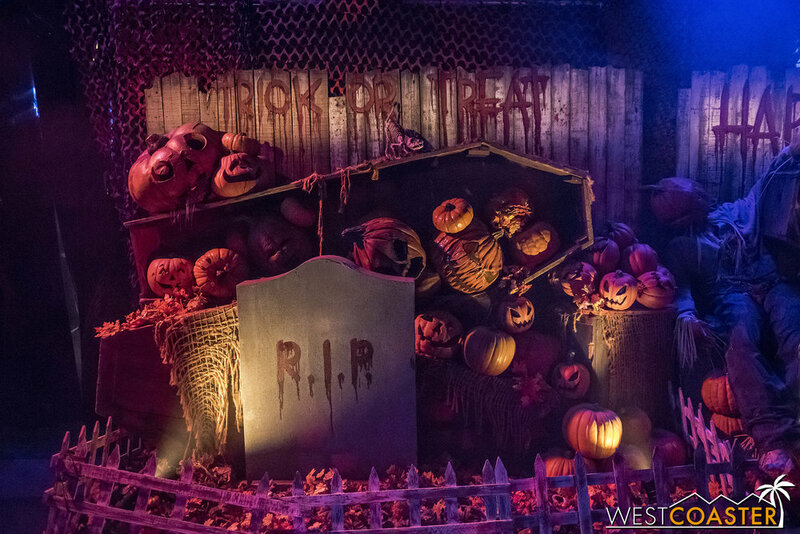 Though not as grand and spectacular as previous scare zones that have occupied this area, Trick ‘r Treat was a perfectly serviceable, enjoyable scare zone. The talent was very active throughout the night and provided great effort, which is all you can reasonably ask out of a cast. A dramatic view up the street. 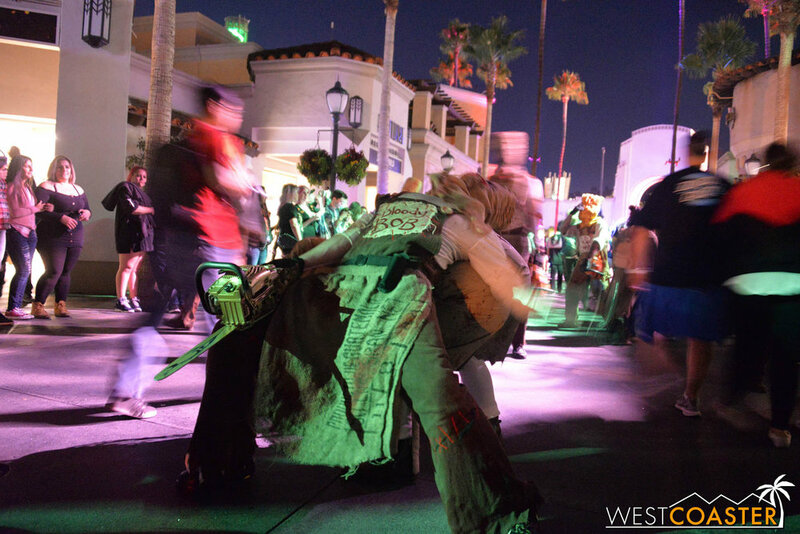 This “one-way” scare zone was really an extension of the Universal: Monsters maze. 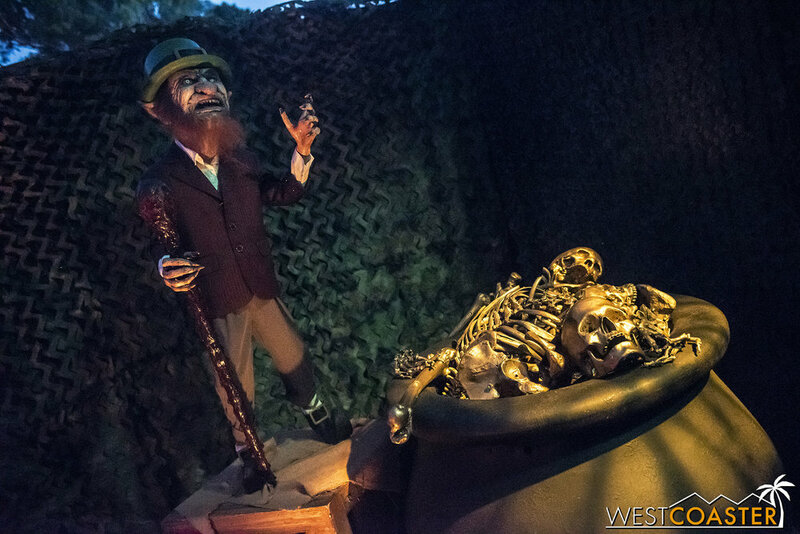 Situated in the Parisian portion of the park, it featured a twisted ball with demented royalty and fearsome guests, all in a sort of gilded, Victorianesque theme. 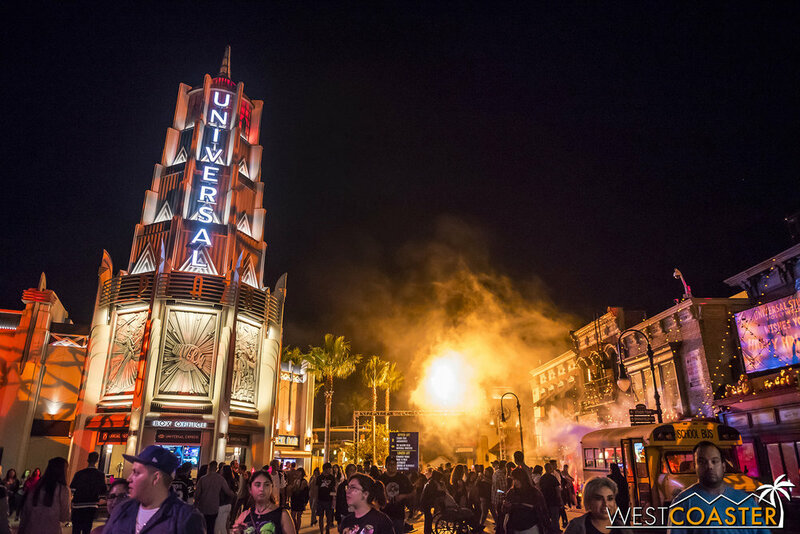 The continuation of the fantastic Universal: Monsters soundtrack, featuring music by Slash, was a great touch, and the layout created a sort of gauntlet for guests to navigate. 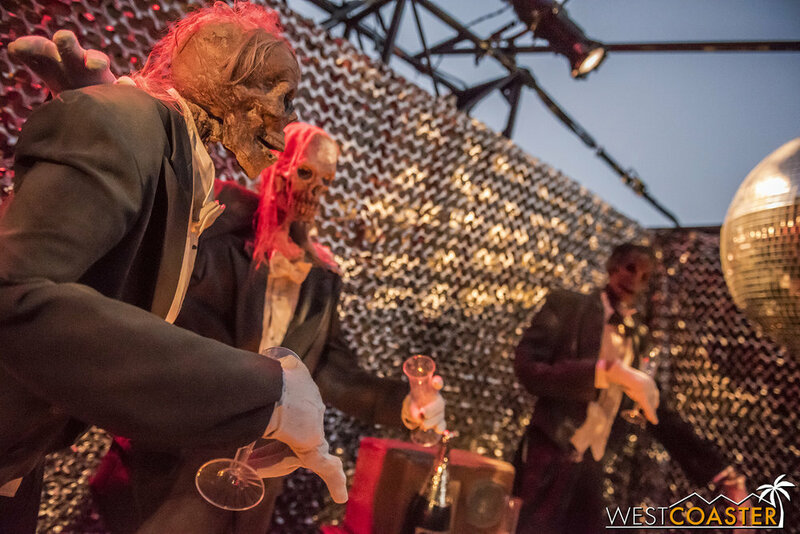 Looks like it’s time for an undead masquerade. While this scare zone was relatively small and not terribly extensive, there’s not much more that could have been done, given the dead end currently occurring here from the closure of neighboring Baker Street for park construction (a Secret Life of Pets attraction is coming soon). 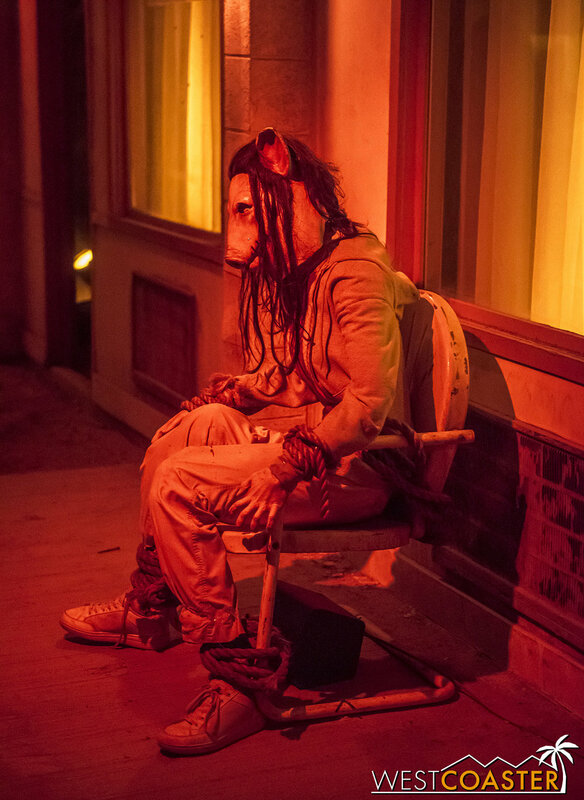 What what it was, we found Monster Masquerade short but pretty enjoyable. The Hunchback of Notre Dame as king? 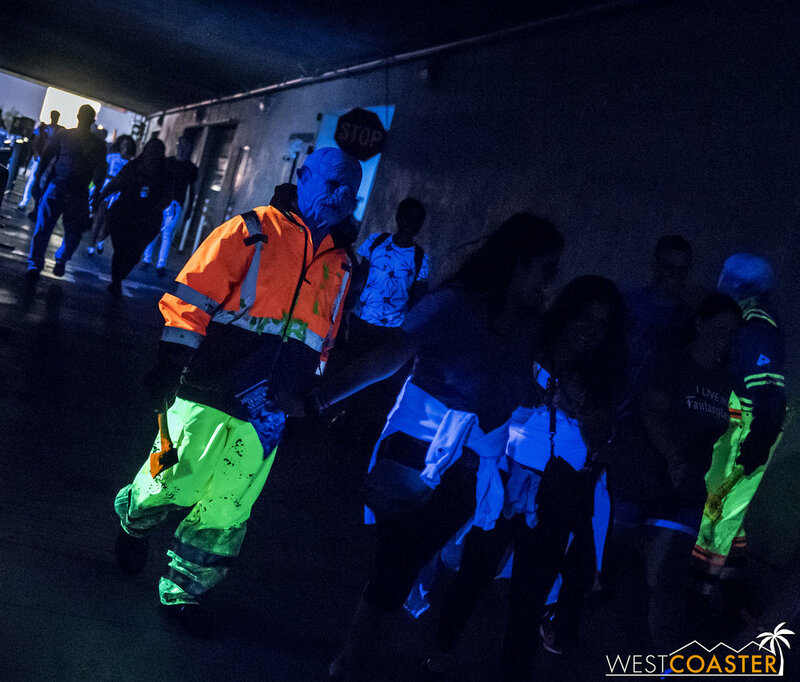 For the second year in a row, the tunnel walkway connecting the Lower Lot with the Metro Lots was a rave party featuring victims of a toxic chemical spill who have now come to exact vengeance. 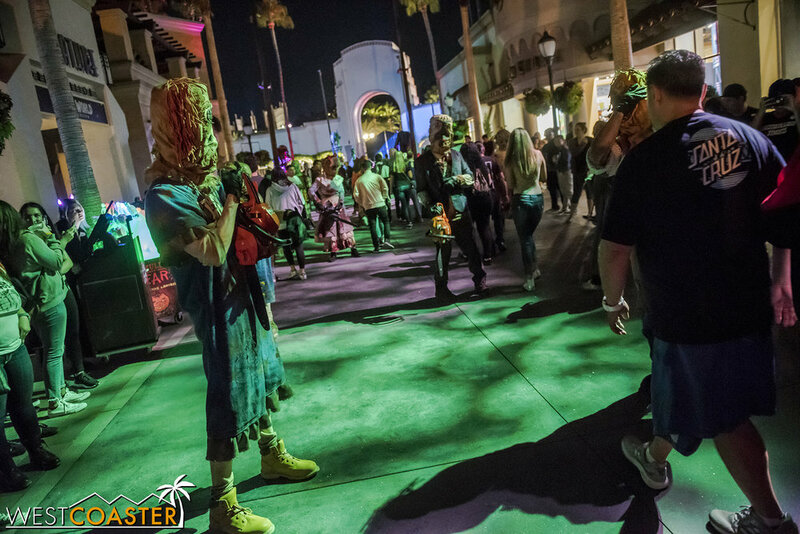 This “scare zone” is really just a passage way, and Universal is understandably resigned to just throwing minimal decor there (it still must function for vehicular traffic during the day for backlot circulation). The Toxxic Tunnel! This year with another X! A lot of people have expressed disappointment that a walking path is the only way to the Metro Lots now, rather than the trams they used to have. I’m okay with this, as I enjoy the steps, and I found the trams to be a longer way in past years. 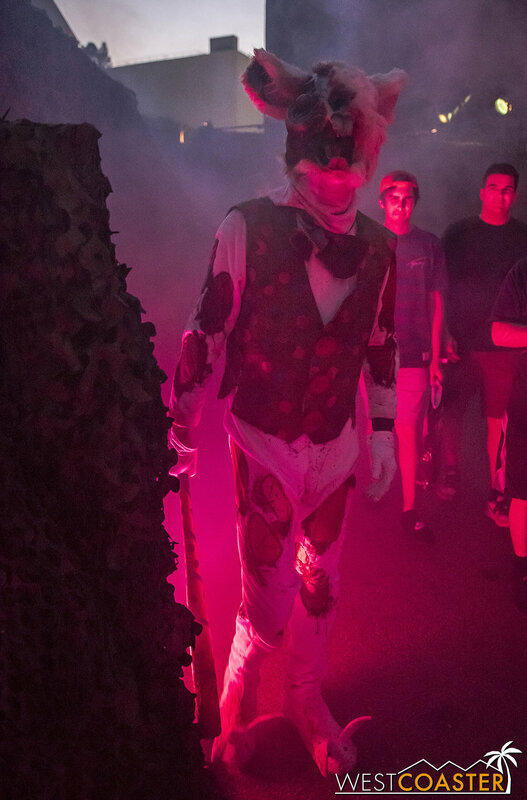 However, for those with medical conditions that preclude walking or make walking difficult, or if guests have concerns with the strobes and their effects, there is a small shuttle available upon request that bypasses the tunnel and wheels guests over to the Metro Lot restrooms, located across from the Metro Lot scare zone and (this year) Horrors of Blumhouse Chapter 2 maze. Given that the lighting (or the dubstep?) can cause legitimate sensory issues for some people, this is worth noting for guests who may be more sensitive than most. The creature are all disfigured from the hazardous waste exposure. 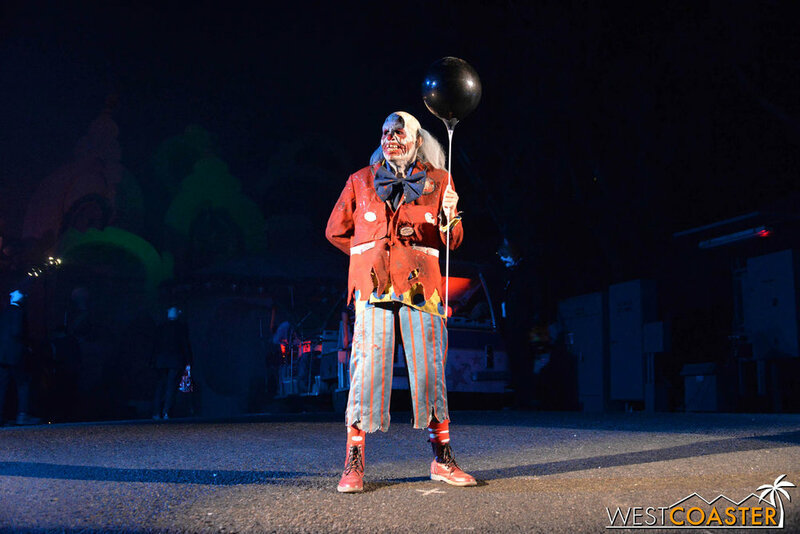 There is a pretty good number of scareactors, but as usual, the theming is limited to lighting and a soundtrack. No actual set decorations. 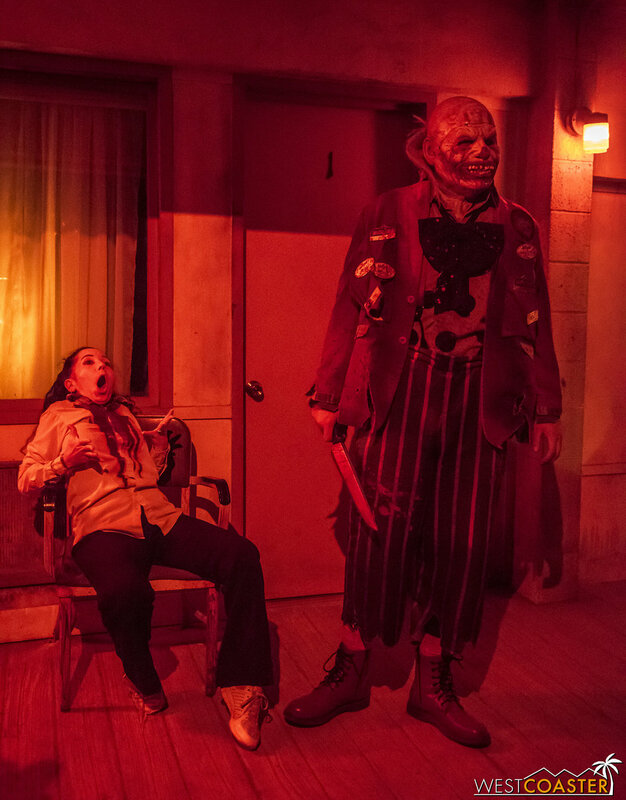 By far our favorite scare zone at this year’s Horror Nights was effectively an extension of our all time favorite scare zone, Dark Christmas, from a couple of years ago. 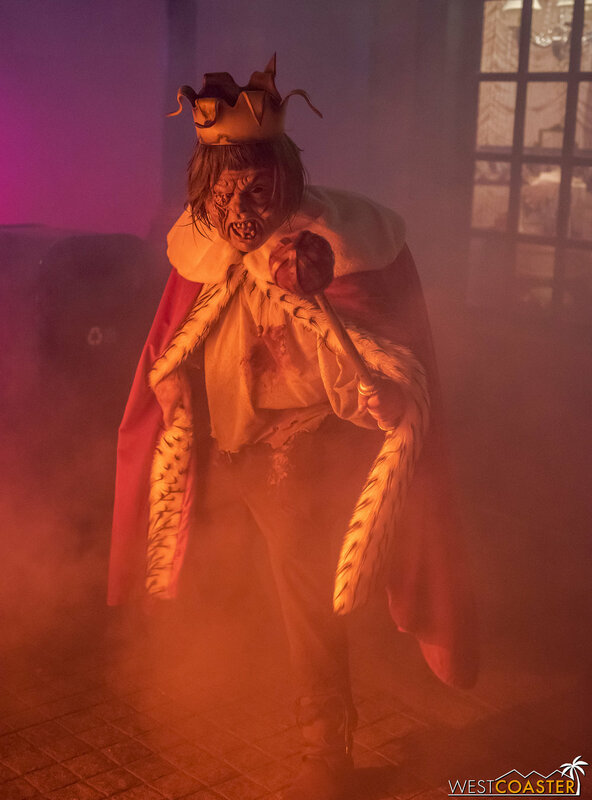 Holidayz in Hell envisions various major holidays of the year, but in horror form! 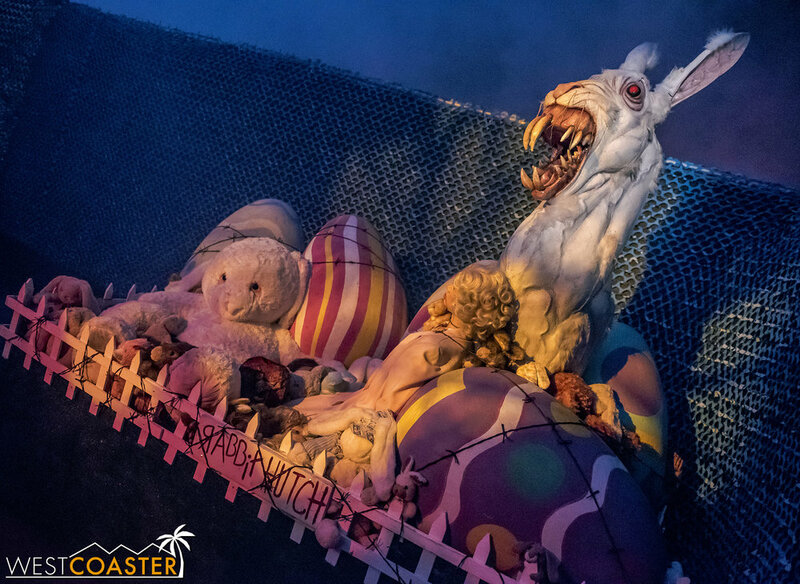 From New Year’s to Valentine’s Day and St. Patrick’s Day to Easter, Cinco de Mayo, July 4th, and wrapping up with Halloween, Thanksgiving, and Christmas (basically a mini-repeat of Dark Christmas), this scare zone had it all. Sure, the theming seemed to be the scattering of Universal’s prop warehouse for all remaining decorations that could be used, but the idea of having terrorizing versions of the holidays was absolutely wonderful, and we were very entertained at characters like a very disfigured Easter bunny, a highly disturbing Cupid, and my personal favorite—the gobbling turkey. Completely with a gobbler used to scare guests. 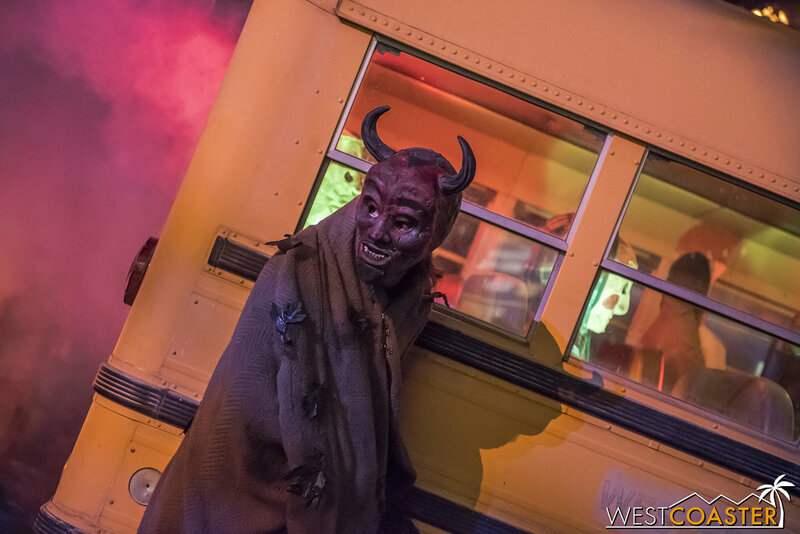 As the Metro Lots scare zone has been in the past, Holidayz in Hell features a gauntlet layout. 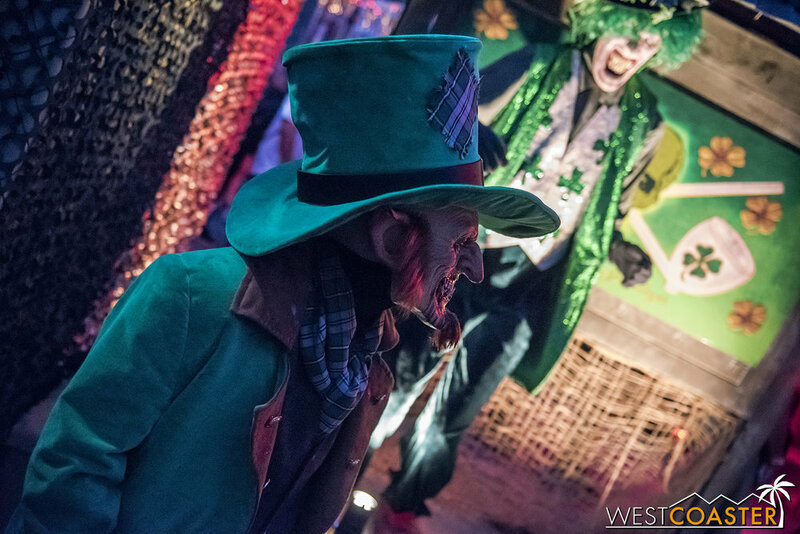 There is only one way in, via the extended walking path after Toxxic Tunnel, and the route is zig-zagging, allowing scareactors to double around and get multiple startles. The talent here seemed to really be enjoying their roles, providing some great scares and sardonic humor. In short, this whole area was quite messed up, and that’s why we loved it! Ring in the new year! Or new fear? Cupid strikes a pose in Valentine’s Day. 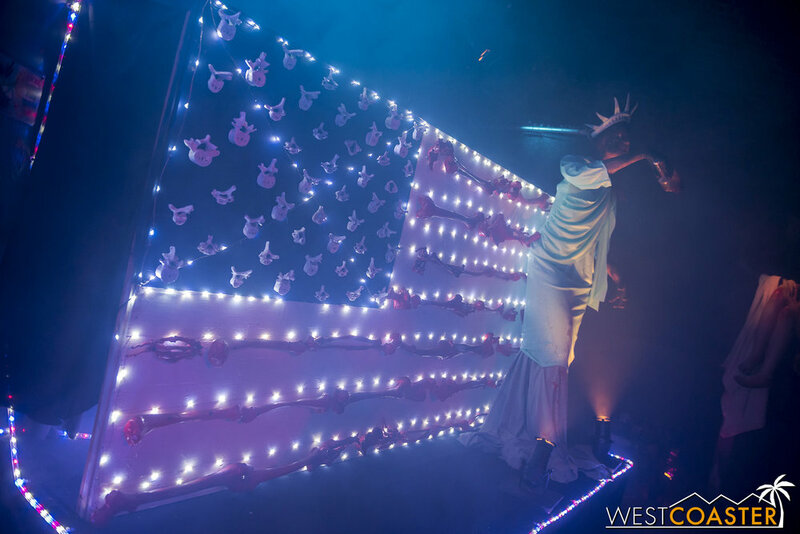 4th of July is here. It’s basically a lot of reused Purge props. Halloween follows after this. Thanksgiving, and the most awesome turkey monster. And finally, Christmas! Dark Christmas. As is tradition, at the end of the night (about half an hour before park closing), all the chainsaw-wielding scareactors gathered up in Hell’s Harvest for the regular Chainsaw Chase Out. 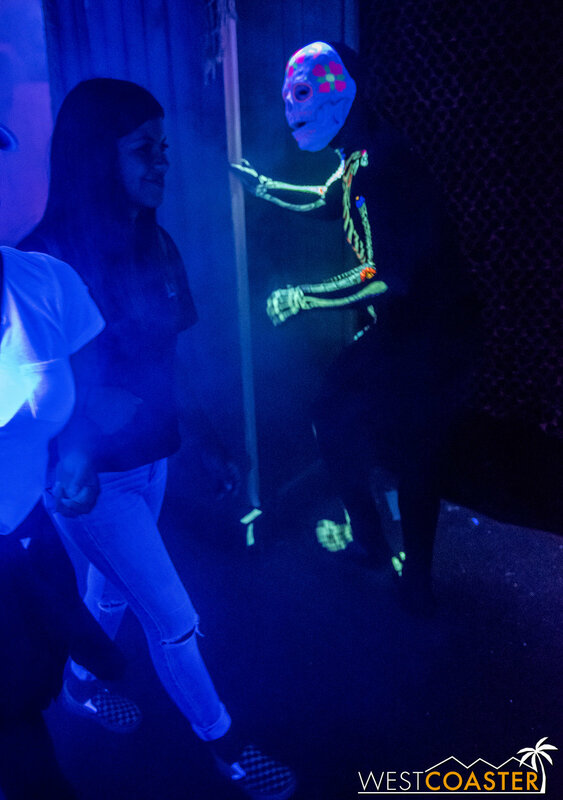 The concept is simple: monsters stand in a rough grid layout, allowing guests to filter through them as they exit. But at a signal, the chainsaws rev up, and all hell breaks lose. 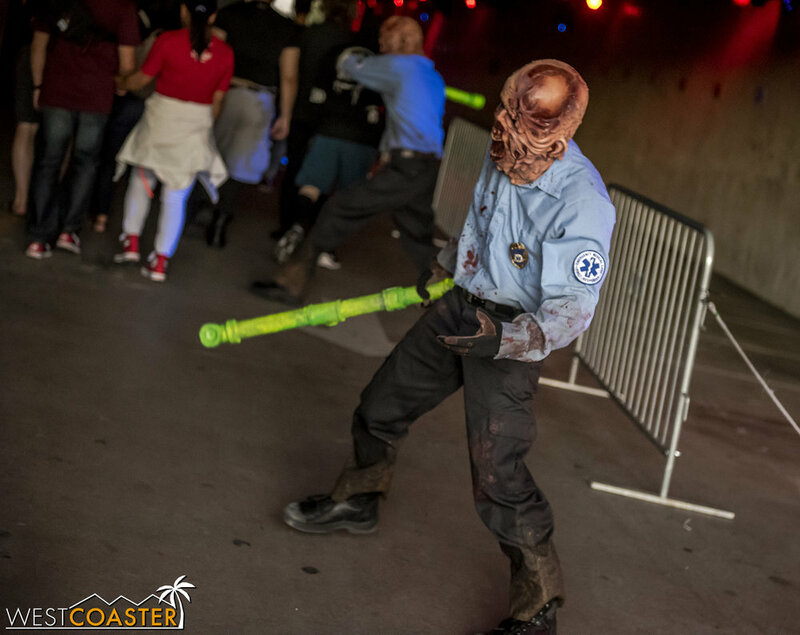 The chainsaw brigade goes crazy, chasing all the terrified guests, generally providing entertainment for onlookers. Hey, it’s time for the Chainsaw Chase Out! Here’s a gauntlet of chainsaws to navigate for those looking to exit! 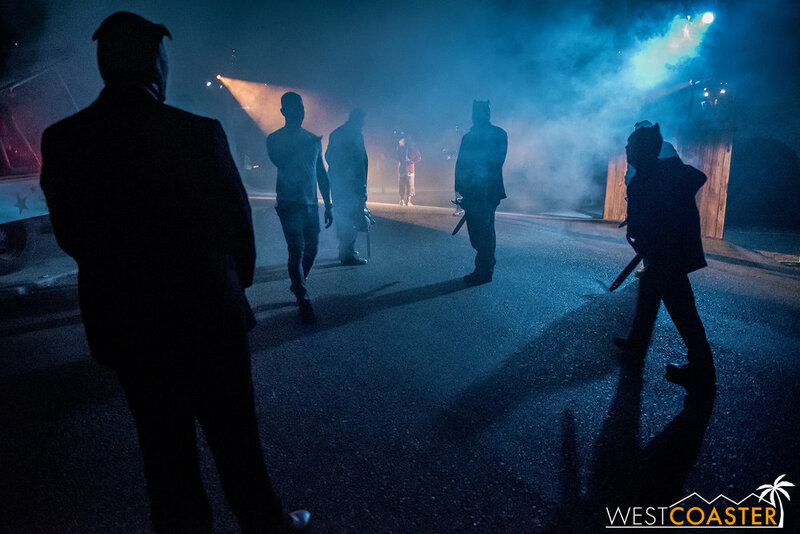 As opening night as become more and more a media and veteran fans event, the effect of the Chainsaw Chase Out has become less dramatic, since most of the people going through know what to expect and aren’t really phased by the roar of chainsaws in such close proximity. But it’s still fun to watch those uninitiated recoil or run away in fright. Watching guests lose it has become a nice pastime to end the night. We also saw some touching moments, such a group of monsters rocking out with a very young fan, headbanging and pay homage to her patronage. 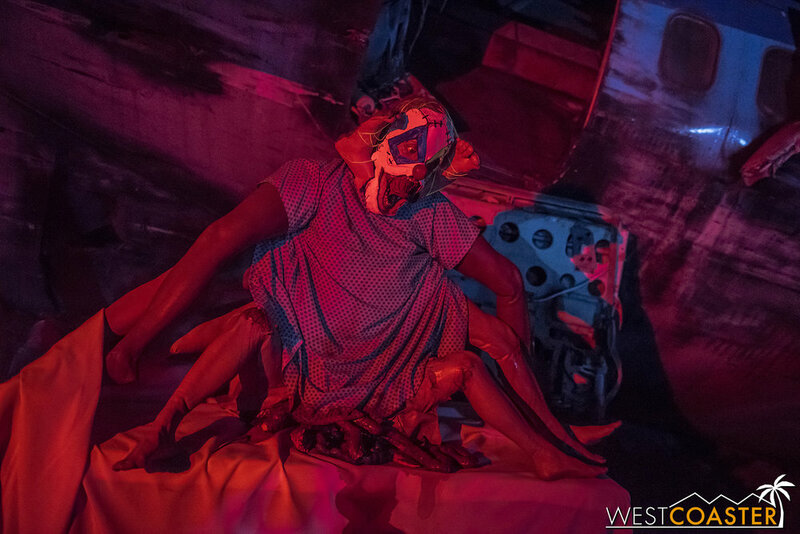 At the end of the night, the scareactors seem to have greater license to let out more of their personality, and the relaxed nature of the Chase Out allows for some great, organic moments. To the leader of the chainsaw brigade: thanks for the lighting assist! 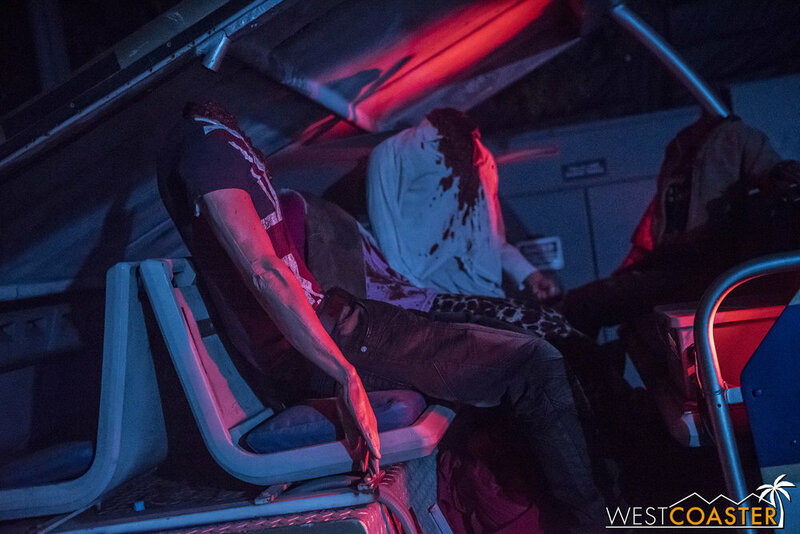 That does it for scare zones and the Terror Tram from this year’s Halloween Horror Nights. 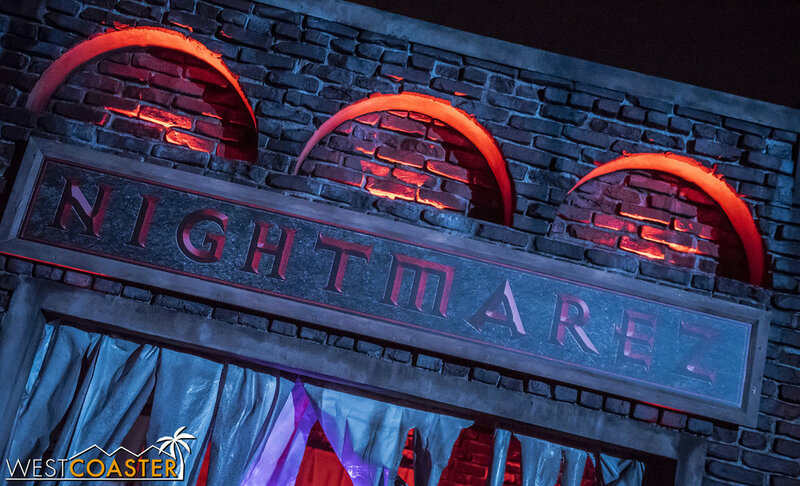 We’ll double back with a look at HHN’s mazes as well, though veterans of the event know what to expect on that end (“Boo Boxes” galore). 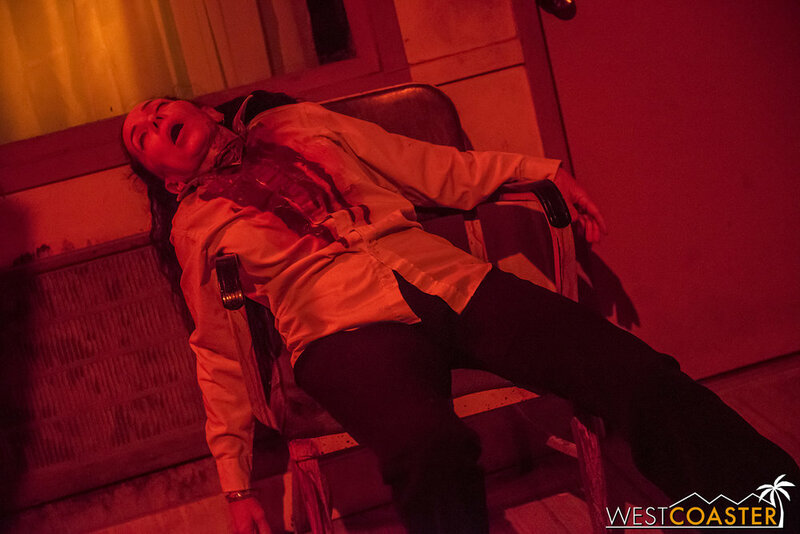 Then, we focus on Knott’s Scary Farm next week. 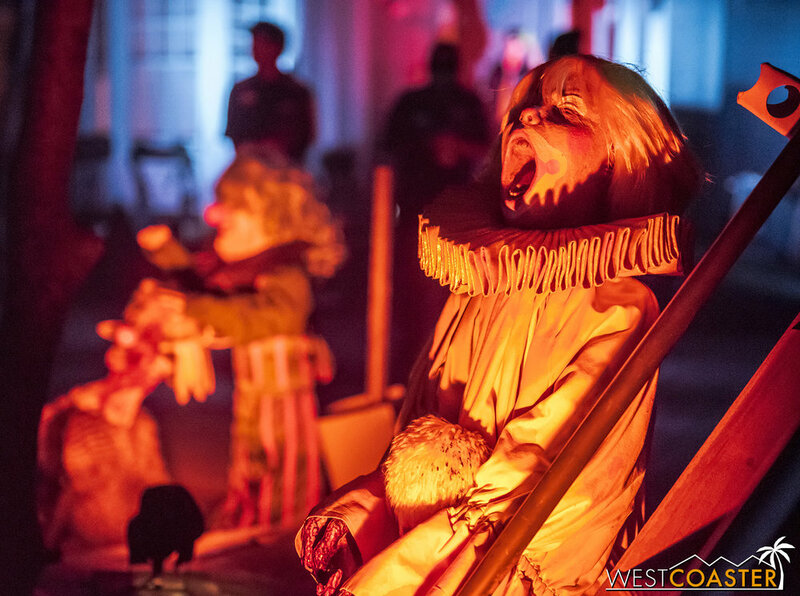 Southern California is blessed to have so many wonderful and high quality haunted attractions during the fall season. 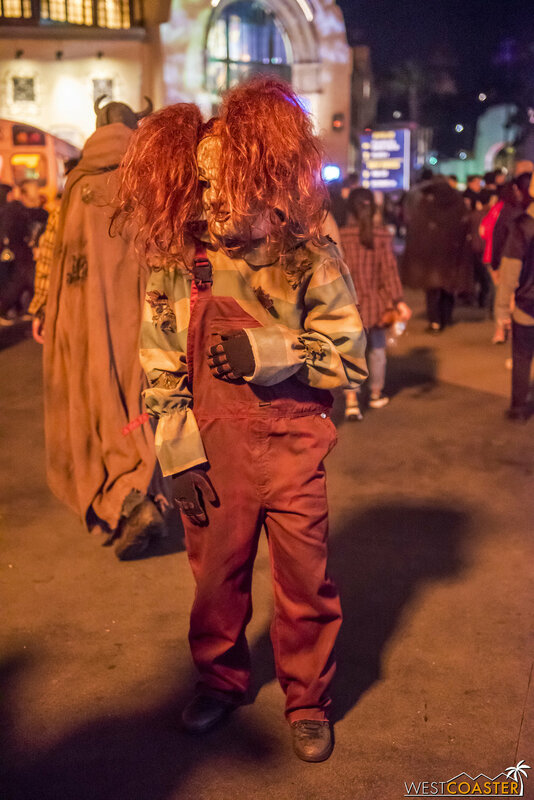 We’re just getting started with our coverage, and you can find a listing of them in our 2018 Southern California Haunted Attractions Guide. Go out and go get spoopy. And of course, stay safe and don’t be a hotshot jerk while you’re out there. 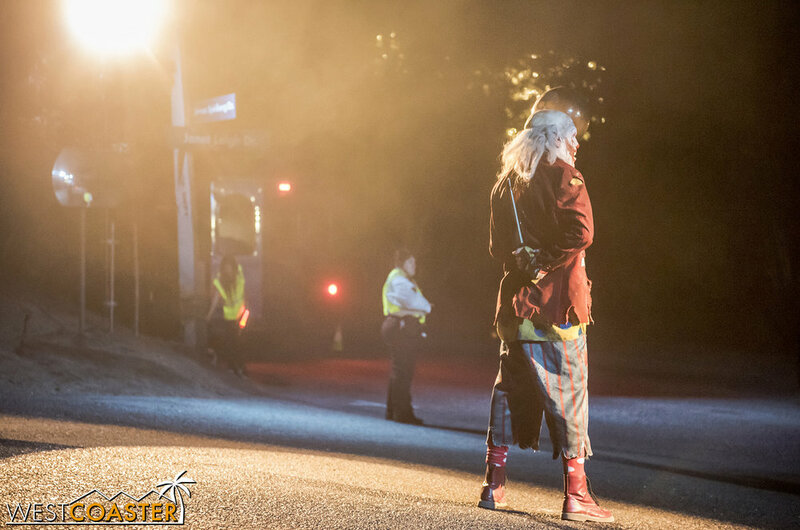 The many monsters and actors and crew who work these events put forth a lot of effort and deserve appreciation.